My favourite sister kindly gave me some interesting beers recently. One of them went part way to answering a question a friend had asked at Woking beer festival: what would a beer made with cannabis taste like? 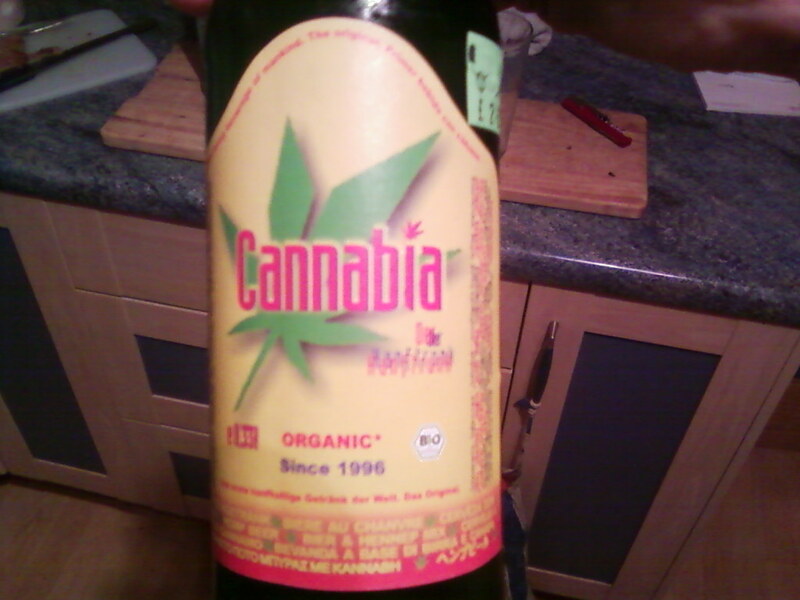 Cannabis is related to hops, so compared to some of the weird things people have put in beer it kind of makes senses. The Cannabia beer I was bought is a hemp beer though. I don't know much about hops that sounds suspiciously like the part of the plant they make ropes out of, not the part that gets you stoned. So probably not what my friend was curious about. And as to how it tastes...well, like a sweet lager. One for interest only I'm afraid. 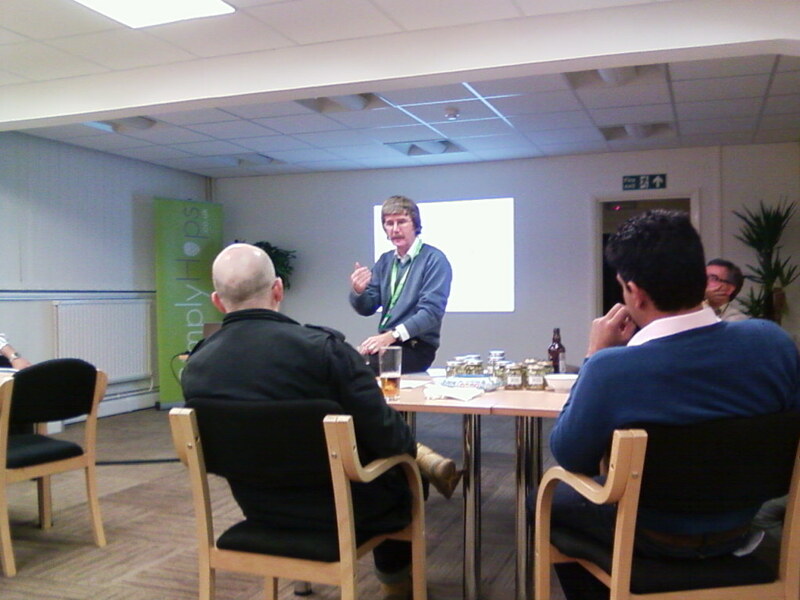 I heard hop expert Peter Darby give a talk on the history of cultivated hops in England the other day. As he poured out distilled essence of hop history I mopped it up as best I could, furiously scribbling down notes. Surprisingly for something going back that far Peter started with the exact year that hops were first cultivated in England for use in brewing: 1524. He said this was a documented date when Flemish religious refugees started growing hops. I think he even mentioned the heresy they adhered to but I couldn’t make it out. I bet it wasn’t neo-kegism though! The hop they grew was the Flemish Red Bine, but they can’t have done that well as in 1560 they had to call over a consultant, Peter de Wolf from Flanders to tell them how to do it properly.  Flemish Red Bine, which was easy to grow and quite disease resistant but coarse and not good for brewing.  White Bines which were difficult to grow but the most prized for brewing. By the early 1700s White Bines predominated and the best were grown in Farnham: Farnham White Bines. Hops were named by their shape, their grower or the place they were grown in. So when Farnham White Bines spread to the Midlands and over to East Kent they became known by different names, such as Canterbury White Bines. By the end of the 1700s one White Bine was selected out by Mr Golding. In the 1800s a number of Goldings were grown, for example Bramling, Amos’ Early Bird and Mercer. East Kent Golding is a marketing term as hops grown in East Kent were now considered the best and does not refer to any particular selection of Goldings hops. During the 1800s various clones proliferated. Around 1875 the Fuggle was released, though Percival’s often repeated account of how it originated from a seed found by Richard Fuggle which had been thrown out with some crumbs from a hop picking basket is simply not true. He would either have been three at the time or have emigrated to Canada four years previously!  Green Bines such as Colgates and Prolific.  White Bines, including Fuggles and ten types of Goldings. The Mathon Golding is the same plant that had also been known as Farnham White Bines and Cantebury White Bines. These plants will have some differences as the soil they are grown in will alter the character of the hops and epigenetic effects can lead to differences in disease resistance even in genetically identical plants. In 1906 Wye College in Kent appointed a mycologist, EF Salmon, who had experience in working with powdery mildew, a common hop disease. He started a hop breeding programme. Looking for marketable varieties he noticed that brewers were looking for resin content, as they gave more bitterness and preservative properties but still preferred British flavours. In 1917 he took the unusual step of using wild American hop plants from Oregon in the USA and Manitoba in Canada to make crosses. This greatly increased the genetic diversity. Seedlings from these crosses were planted out in 1919 and one of them became Brewers Gold. This hop had double the alpha acid (potential bitterness) content of the other hops available at the time and is in the pedigree of every high alpha hop in the world today! Hops evolved in Southern China 6.5 million years ago and the population separated 1.5 million years ago, spreading West and eventually reaching Europe and East over to North America. When these divergent populations were reunited in breeding programmes increases in alpha acid content, mildew resistance, dwarf varieties and new aroma possibilites were opened up. In 1978 Ray Neve rescued the Wye hop collection from a wilt stricken field and replanted the hops in two separate areas. Peter Darby took over in 1981 and by 2006 the collection had 1500 plants, including 120 named varieties with 70 of these English (including 10 different clones of the Golding variety). Some of these plants had a history going back to 1737. Funding from the government stopped in 2006 and the terms of the lease said the fields had to be returned to arable land: all the hops would be grubbed up unless funding could be found. The National Hop Association decided they couldn't allow this and rapidly raised money. The hop collection was rationalised: varieties that could be obtained elsewhere, duplicates (plants that had different names but where identical in character and genetics to other varieties) and hops that had been superseded were removed. This got the collection down to 784 accessions, including the 120 named varieties and 361 males. In 2007 they were planted in a new hop garden and in 2008 the core (including all the English varieties) were also planted in a second site as a precaution against disease. In 2009 the paperwork was submitted to a body that now goes under the name of Plant Heritage and in 2010 these plants were declared the National Hop Collection, which gives the collection more prestige and should help secure its future. The plants in the collection are still actively used for crosses and from next year the collection will be open to the public through the Shepherd Neame visitors centre. Pervious hop selections were made using the judgement of the researchers but using modern scientific techniques the collection is now being analysed more systematically and the brewing characteristics analysed. Wye hops have recently developed two new varieties: Endeavor which has a Cascade like flavour and Aramis which is grown in France. Some older varieties which were previously rejected are also being looked at again to see if they are suitable for modern tastes. I think I’ve got the details down correctly, but sadly I have no references, only the notes I scribbled down. A talk about Australian hops followed, and on leaving we were given a goody bag of small samples of various new, old and Australian hop varieties which I will no doubt return to at some point soon. I was a very interesting meeting put on by Simply Hops last night. Amongst the wealth of information I got from the gathered hop experts was the fact Farnham hops are still grown today as Mathon Goldings. More details when I get a moment. Has there ever been this much excitement in Woking? Probably not since the martians landed. For the second week in a row my beers have been available on draught. 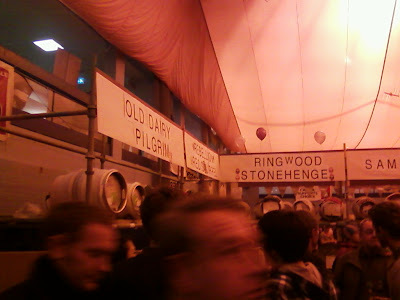 This time it was at Woking beer festival, surely a highlight of anyone's drinking year. Being held in the leisure centre it may lack the atmosphere of Farnham but on the plus side it's in walking distance of my house. Or maybe more accurately walking distance on the way there and staggering distance on the way back. The festival glasses had gone back to looking decidedly unrighteous but I didn't let that put me off. When you drink in the ways of righteousness like I do it will take more than that to stop you. As my beers were handily close to the entrance I checked them out early on to make sure they were on top form. Which indeed they were. Other delights included the mighty Oscar Wilde mild, Bingham's Old Ale, Dorking Winter Ruby and Fuller's Golden Pride. I only had a sip of the last one as at 8.5% ABV it's a bit much to be knocking back. I met up with loads of people, including bizarrely enough the bloke who'd been our tour guide when we went round Jennings. I had an interesting discussion with him on the merits of sparklers, but I'll say no more on that matter. It was an excellent night, and I found out the next day that we'd done rather well in the festival competition, so unusually for the day after a beer festival it's been an excellent day too. 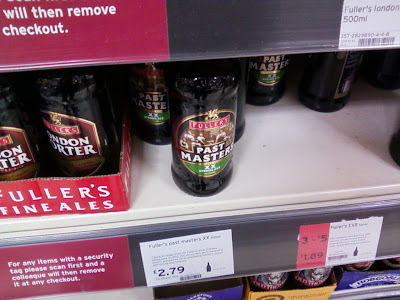 If I'd known it was going to appear in my local Sainsbury's I wouldn't have travelled up to Chiswick to pay £4 a bottle for it. In the latest issue of the IBD magazine I was pleased to see a report from New Zealand stating: "Like all over the world, cask ales are experiencing a renaissance here..."
As many beer bloggers in Britain have succumbed to the neo-kegist heresy it's nice to hear that devotion to beer as god intended is growing across the globe. Living bleeding miles from work as I do I don't often get to drink my beers on draught. So for my official birthday do I arranged for some to be on tap closer to home. We got down the pub for half seven and started guzzling the Blue Top. At 4.8% ABV it's a bit stronger than stuff I would normally knock back by the bucket load but hey, it's was my birthday (almost). It must have gone down well with my mates too as by a quarter to ten the cask had been emptied and replaced with Gold Top. The festivities continued until closing time and a good time was had by all. But the next day was not so good. Is it my age or was it just the vast quantities of beer consumed? The power of pork did provide some relief (I'd specially stocked up on black pudding for the fry up) but I was definitely not at my best. I managed to drag myself to the climbing wall in the afternoon, and whilst I'm used to gravity often being unusually strong when I go climbing this time it was a struggle to even leave the ground. It may have to be lettuce and water for me this week. 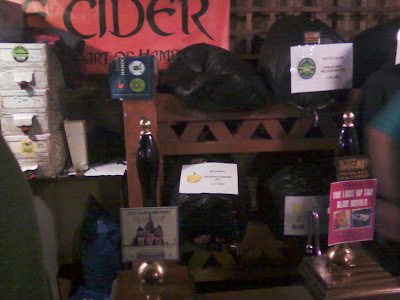 I called in at the Egham Beer Festival last night. 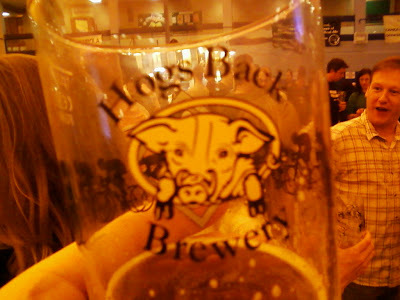 As ever they had a very impressive range of new beers and the place was packed. Can the best pub in Woking get any better? As a matter of fact it can. This weekend the guest beers at The Crown will have been brewed by me. 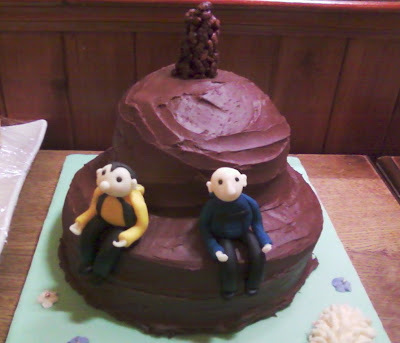 My mate Gordon and I are both hitting 40 this year* so to celebrate we're having a joint birthday do on Saturday, and the landlord's gone out of his way to make sure my beers will be on. So if you want to drink the best beer in Woking this weekend you know where to go. *He's an old git already while I'm still in the last flush of youth. "In 1750 there were six well established varieties: Farnham Pale, Canterbury Brown, Long White, Oval, Long Square Garlic and Flemish. Farnham Pale was regarded as the best quality hop but with the introduction of Golding in 1795 it became just another hop that was eventually superseded by Fuggles"
Farnham's not far from where I live, and has an excellent beer festival and some cracking pubs. Beer nerd that I am I have wondered if the hops are still around anywhere, and much to my delight I now know they are. On the last page of Beer magazine Jody Scheckter of the Laverstoke Park Farm says of their beers: "I also insisted we use heritage hops not in wide commercial use, such as Fuggles, Farnham White Bine and White Grape".